I am a cheese and crackers kind of gal. Love love love ’em. Or rather, I did. When I ate cheese. 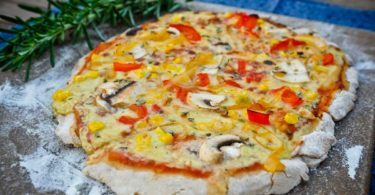 Now that I don’t eat cheese anymore I find myself looking for new options – and it turns out, I get a lot more interesting variety! 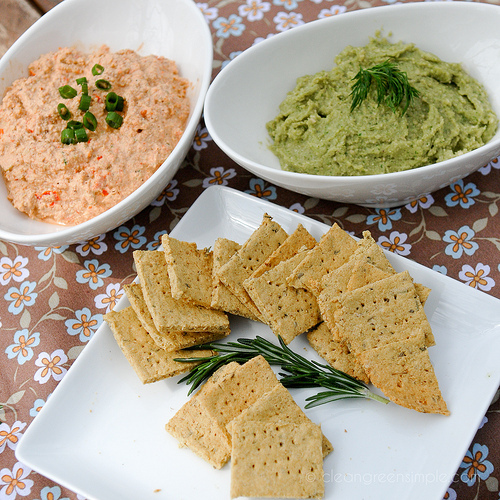 Both of these spreads are delicious and perfect for spreading on some crackers or using as a dip for fresh veggies. The first one is a raw “Mock Salmon Paté” which I got from Living on Live Food by Alissa Cohen. That book seems to out of print but it’s got a bunch of good recipes in it if you ever run across a copy! This “paté” doesn’t exactly taste like salmon or anything but it’s pretty and pink and has a nice creamy savory flavor. 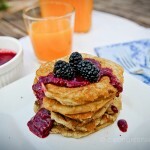 I recommend it for parties – omnivores will never guess it’s all raw and vegan and health-foody. 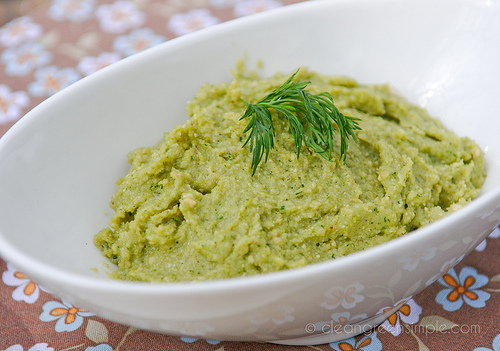 The second dip is an Onion and Dill blend that I just made up, and I think it’s pretty good too. If you want a creamy oniony spread this will do the trick nicely. Both of these are super easy – just combine a few things in the food processor and blend away. 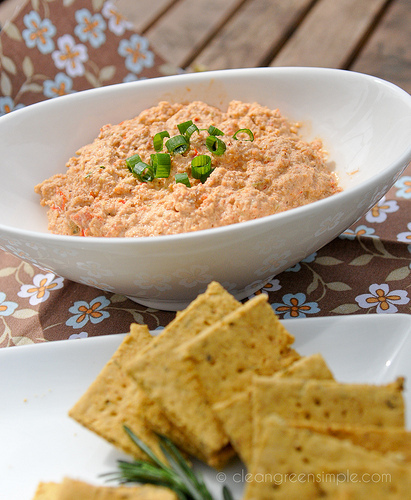 Serve them with homemade crackers or crispy vegetables for a fun snack! Both of these pates look great – and so simple too! Mmmmm… I love dips and these sound so so good!! Just wondering why you say un-soaked nuts? I’m new to this but keep hearing soaking nuts is better for you.